Be JAPON is a Japanese non-profit cultural organization dedicated to presenting Japanese beauty to the world under its concept of “tradition and creation.” The organization’s shows have been performed across eight countries, showcasing the aesthetics of Japanese traditions through antique kimonos that date back more than 150 years and have been revived for a modern look, live music and dance performances, and movie clips depicting the four seasons of Japan. “Beyond KIMONO 2015” is a comprehensive exploration of the beauty of Japan through the five senses. Japanese dress/kimono designer Eiko Kobayashi, Chairman of the Board of Be JAPON, uses antique kimono to develop modern and novel styles of dress while honoring the traditional hand paintings, embroidery, and dyes. 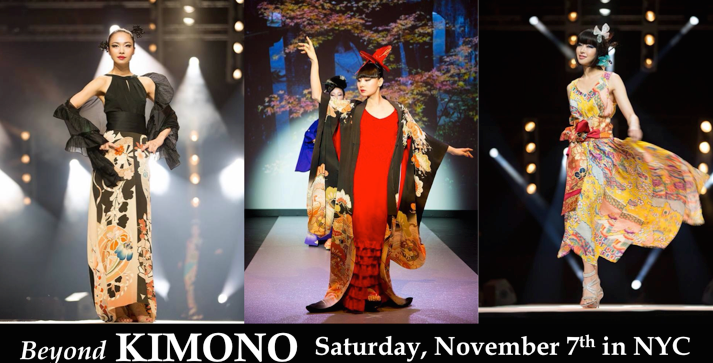 In addition to the fashion show, there will be on-site sales of Kobayashi’s Kimono dresses. The program is in collaboration with pianist Gohei Nishikawa, who made his debut at the Lincoln Center in 1999. After being diagnosed with dystonia, a neurological movement disorder that causes painful and uncontrollable muscle spasms, he lost the use of three fingers on his left hand. The disorder almost ended his career, but through rehabilitation, he has learned to play brilliantly with seven fingers. A reception will follow the program and will feature Dassai Sparkling Sake, Sapporo Beer, Ito En Japanese green tea, and Japanese creative cuisine. To purchase tickets, please visit Beyond Kimono’s Eventbrite page.